Foursquare - the mobile geographic game that you play on your phone - is back with another deal with American Express. 'Check in' at a Shell petrol station and spend £50 in a single transaction (on fuel and / or any other purchases) and get a £15 statement credit when you pay by American Express. I doubt you'll find any cheaper petrol than that..
Also collect Shell Drivers Club points on the transaction. 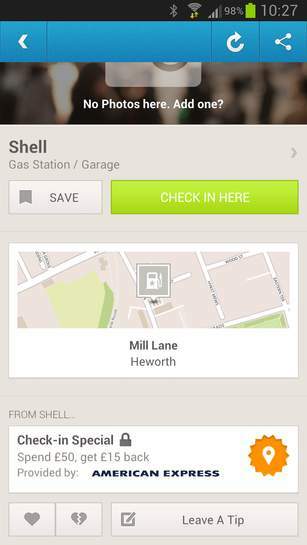 Next, locate your Shell station at foursquare.com/ and you'll find the promotion come up. After checking in at the petrol station, you'll be prompted if you want to redeem the special offer. You 'load to your card' and then you're ready. Typically, you get a notification shortly after your purchase is finished that you'll get the statement credit. Double points on fuel spend if you have recently opened (or want to open) an Amex Preferred Rewards Gold Card (First year only). + £2 Topcashback now as well with Snap and Save App. Although there is a Shell station here in coventry the nearest one with the offer is in Lichfield which is 30 miles away. Anyone know when this expires? Just put in a tank of diesel good for 3 weeks! Great deal. Loaded to card - thanks. Great. Have some heat. Does anybody know where to get the list of foursquare specials? The foursquare app itself didn't reveal this deal when I just searched on "Specials". Hot dang, that is a good deal. Just need to run my fuel down now since I always usually come to just under 50 quid unless it's really empty. BTW, offer ends in April in case not already mentioned and its the total spend so can add a cat wash or good from shop on to make up 50 quid, but obviously to maximise the bargain I want to try and keep this all to fuel. haha fail. I admit it is annoying having to ask all the time, but we'll worth the small hassle got these sort of bargains. Great. Have some heat. Does anybody know where to get the list of … Great. Have some heat. Does anybody know where to get the list of foursquare specials? The foursquare app itself didn't reveal this deal when I just searched on "Specials". same here, I searched specials and found loads I never knew existed but not this one. only when I searched shell did it come up. perhaps the OP can tell us how he heard about it. I must be missing out on loads off them. Hot dang, that is a good deal.Just need to run my fuel down now since I … Hot dang, that is a good deal.Just need to run my fuel down now since I always usually come to just under 50 quid unless it's really empty.BTW, offer ends in April in case not already mentioned and its the total spend so can add a cat wash or good from shop on to make up 50 quid, but obviously to maximise the bargain I want to try and keep this all to fuel. Over Christmas I got a 57 pound clarins gift box for 27 quid thanks to Amex. You want to make sure you have it ready for these offers! Nice deal, I've already made back £100 from my xbox with Amex! And if my maths is correct this means 10 liters for free!! 6 Amex cards to use, so that's £90 of free fuel! Doing well recently, what with "shop small", the weekend VIP west end shopping event before Christmas and Harvey Nics offers. Had quite a few hundred quids worth of stuff. A CAT wash? Where is this?? I have to see this!! can i buy fuel giftcard? Keep getting the "The system cannot validate your Card information at this time." error when I try to log in. What is Foursquare? And during the sign up it says I have to be ok with American data processing laws - and they aren't as good as ours are they? ... can add a cat wash or good from shop on to make up 50 quid, but … ... can add a cat wash or good from shop on to make up 50 quid, but obviously to maximise the bargain I want to try and keep this all to fuel. comes to 92p per litre for unleaded if you put petrol for £50. I'm with Foursquare and used the Amex deals before,but haven't figured out how to find them other than finding posts on here or random searching while out shopping. . Anyone any idea of a web link that shows current promotions. I'm with Foursquare and used the Amex deals before,but haven't figured … I'm with Foursquare and used the Amex deals before,but haven't figured out how to find them other than finding posts on here or random searching while out shopping. .Anyone any idea of a web link that shows current promotions. 6 Amex cards to use, so that's £90 of free fuel! Doing well recently, … 6 Amex cards to use, so that's £90 of free fuel! Doing well recently, what with "shop small", the weekend VIP west end shopping event before Christmas and Harvey Nics offers. Had quite a few hundred quids worth of stuff. I get the message you haven't unlocked this special when I click on the Shell offer - any ideas how I unlock it?